NELA Kidical Massive rolling in September of 2015 (above) was a fun day. 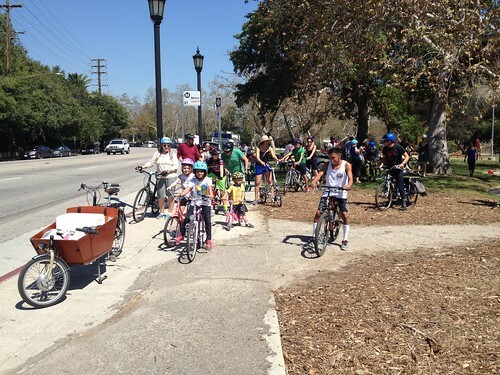 NELA Kidical Mass is rolling again this coming Sunday, April 17, 2016 from 11 a.m. until 3 p.m. at Sycamore Grove Park (4702 N. Figueroa St., Los Angeles, CA 90065). Facebook Event link? Click here and check it out. Kids, bikes, scooters, hand wagons, skateboards; meet us at Sycamore Grove Park at 11 a.m. We’re going to play on the playground, eat snacks, dance, play, have a rolling wheel rally and bash open a pinata in a celebration of family, community, bikes, and each other. We’re co-hosting this event with our friends at Si Se Mueve, a community run series of bike rides, hikes, tours, and social events. Meet at the playground by Ramona Hall. No reservations required, nor sign up sheets, nor waivers, nor fees. Bring something to eat (and share! ), a picnic blanket to sit on, etc. Ample street parking available at the park. Two public free lots also available at the park (one beside Ramona Hall, the other at South Avenue 49). Gold Line access right across the street from Southwest Museum Gold Line station. Metro 81 bus access available 24/7 on Figueroa. There is a Facebook Event post for this party.